The book is for Dynamics GP users or Dynamics GP partners. It assumes that you have a basic understanding of business management systems and Microsoft Dynamics GP. The latest release of Dynamics GP 2016 offers a powerful, adaptable, and cloud enabled enterprise accounting software solution. The new version has experienced changes in serviced-based architecture, workflow, existing functionalities, and the introduction of plenty of new features. This book will help you get the most out of Dynamics GP quickly and effectively. This book picks up where implementation training leaves off. 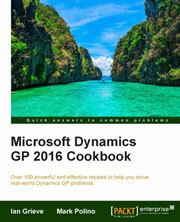 Whether you are new or experienced, you will find useful recipes to improve the way you use and work with Dynamics GP. The book starts with recipes designed to enhance the usefulness of Microsoft Dynamics GP by personalizing the look and feel of the application. Most of the recipes are designed to give you tips for a typical installation of Dynamics GP, including core financials and distribution modules. The book then moves through recipes that include automating Dynamics GP to allow users or administrators to focus on value adding tasks, connecting Dynamics GP to Microsoft Office, exposing hidden features in Dynamics GP, PowerBI, and much more! This book follows a recipe-based approach with a problem-solution mind-set. Each recipe is independent of the others; real-world tested, and designed to be used immediately.